I was looking for a hobby, the problem was, I had no idea what to do. One Saturday about 20 years ago, my wife saw a sign advertising wood carving classes at a local store so we stopped in. On a whim, I bought a few tools and registered for a class – quite certain it would be a disaster. That was the beginning of a passion for wood carving – and tool collecting - that continues to grow. I was determined to learn everything and took advantage of all the local classes and then hit the road to attend classes taught by the most recognized carvers. I tried many styles of carving but it didn't take long to realize that caricature carving was for me. I enjoy creating a humorous scene that tells a funny story. The highest praise I receive is when someone laughs at my carvings. After a few years I began designing and carving my own caricature figures, some of which have been featured in Wood Carving Illustrated and Carving Magazine. My carvings have won numerous First Place and Best of Division awards, including "Best of Show" at the 2012 and 2014 Caricature Carvers of America competition and Editor's Choice Nominee for Best Design, Wood Carving Illustrated Magazine. 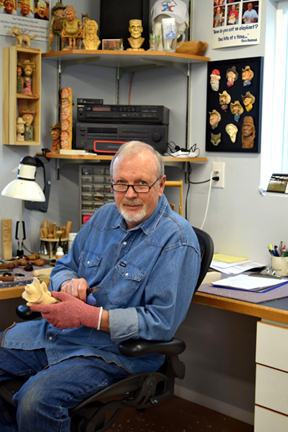 In 2014 I received the honor of being elected as a new member of the Caricature Carvers of America, a non-profit organization dedicated to promoting the art of caricature carving. 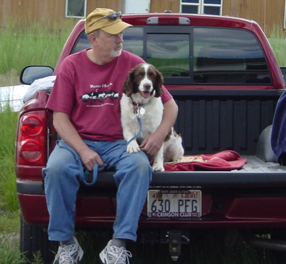 My wife, Kerry, and I live in Holladay, UT with our 2 dogs. Dale working in his new studio. CCA Info and site here.